Save this month on water spot coating for all glass shower doors. 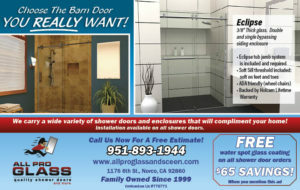 Choose from a variety of barn door type shower doors, bi-pass, shower enclosures, frameless 3/8″ glass custom enclosures. We carry many manufactures of shower door unit and many types of glass styles and frame colors. Plus we can frame and install a variety of wall and vanity mirrors for you home and office. Come visit us at our location in at 1176 6th street Norco 92860. We have installation services on all shower door, plus free delivery.